One company you'll be familiar with, and the other less so, yet both were successful pioneers in the personal computing revolution of the 1980s and both were founded by ferociously talented geeks. The first is Microsoft, co-founded by Bill Gates, who capitalised on his initial success in operating systems with MS-DOS and Windows by striking gold with Word and Excel. The other? Computer Concepts, a British software start-up that found fortune by allying itself to names that are now computing legends: the BBC Micro, Acorn Archimedes and Atari ST. Computer Concepts was founded by a technology whiz kid called Charles Moir. He built his first program, a word processor called Wordwise, for the BBC Micro while living at home with his parents. At its peak, Computer Concepts was the largest developer for the Archimedes and the BBC Micro, which last month celebrated its 30th anniversary. 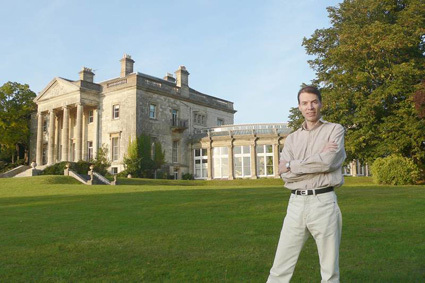 Such was the demand for Computer Concepts' gear that within two years of coding Wordwise, at the age of 23, Moir had made his first million, which he used to buy a Georgian mansion – Gaddesden Place, designed by architect James Wyatt. Gaddesden, which has served as a location for film and TV shoots, is still Moir's HQ. Yet the company was something of an open secret, known only to those who knew and loved its software. Moir tells The Reg it survived through word of mouth – friends telling friends. Thirty years on, Computer Concepts is now called Xara – and it's a subsidiary of German software company MAGIX after being bought in 2007. Moir is managing director and employs 25 people. Xara celebrated its 30th birthday last year. Speaking to The Reg, Moir said he prides himself on running a "technically heavy" operation and having avoided the worst excesses of marketing and sales hype characteristic of US companies such as Microsoft. It wasn't long after Gates hit the big time that the word "vapourware" gained currency and marketing staff would get hold of products under development and begin making sky-high product delivery and feature claims, progressively sapping punters' faith and robbing vendors of credibility. By contrast, Moir boasts that Wordwise delivered a fully functioning word processor in just 8KB of memory – vital considering the micro quantities of memory available in the machines of that time: "less than the size of a jpeg on a website," he says. "Our sales and marketing have never been great or American-style BS marketing, which is more hype and fluff rather than any real content," Moir says. From day one Moir brought a geek's passion to his work running Computer Concepts, which not only meant his company prioritised engineering over marketing, but also dictated fateful platform choices. Before Computer Concepts, Moir had been interested in electronics and he'd belonged to computer clubs. After he had finished school, he avoided university and was tinkering with his dad's business instead. But aged 17 fate took a hand: Moir met Acorn founders Hermann Hauser and Chris Curry. By the age of 21 he'd written Wordwise programming in his bedroom. Demand for those early machines exceeded expectations and sometimes supply: the BBC's target for the BBC Micro, for example, was 12,000 units but in the end 1.5 million went to eager young geeks. BBC Micros sat in 85 per cent of British schools. Moir tells us: "The BBC Micro became huge and the product I did, Wordwise, became very popular on the back of that. All of a sudden I was making a fortune much to the amazement of my parents, because I was 21." The Xara boss, who is deliciously frank in his assessment of the people and companies from those early days, claims some inside knowledge steered his decision on building Wordwise. The BBC commissioned the Micro as part of its Computer Literacy Project because it was looking for a computer to adopt. There was battle for the contract to build the machine between Acorn and Sinclair - Sir Clive's company that build the ZX Spectrum - but it wasn't a squeaky clean fight. "The BBC employed some consultants to tell them the spec of the machine they should be looking for. They chose a guy who knew a guy at Acorn," Moir claims. "I knew the BBC computer was coming. I knew the guys at Acorn and at that point I'd started writing software in my bedroom."